Viget's Durham office facilitates Refresh the Triangle each month, and if you're local to the area you should have been in attendance last night. Robbie Allen, sole founder and CEO of the StatSheet Network, spoke about his experience running a web startup in the Triangle area. Here are my top three highlights from the talk and why the meeting was one of our best yet. Don't believe the hype! People like to say that 8 or 9 out of 10 businesses fail, but Robbie called that a myth. According to the Small Business Association, 50% of businesses survive four or more years. Take heart! Execution trumps ideas. Having an idea is easy, executing is hard. Robbie's business, StatSheet, is one of those ideas that lots of people claim to have had long ago. Robbie's success is, of course, based on his hard work, not having some perfect idea that no one has had before. Competition is good. Robbie shared stories about talking to ESPN and the like about what he has built to date. Why share ideas with potential competitors? The way he sees it, he can only benefit from their efforts to copy what he has already done or their interest in beating out another competitor by building off the work he has in place. New faces. 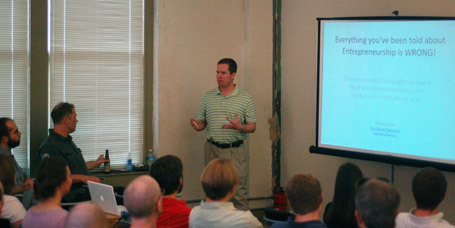 We collaborated with other local groups that meet monthly - NC Startup Blog and NC Startup Drinks. It worked well because Robbie's message was applicable to anyone interested in startups and because entrepreneurship is always a fun topic. The turnout was solid in terms of numbers (between 40 and 50), but even better in terms of diversity of interests. Fantastic Q&A. Kudos to Robbie for leaving time for so many questions and for being so good at fielding them. I wish everyone had his knack for handling comments and questions. His answers were brief, honest, and often humorous. It was very ... Refreshing! BYOB. We had never done this before last night. Not very many people brought their own beverage, but there was some wine and beer on hand and I think it helped promote a friendly atmosphere. Congrats to Robbie Allen for recently being awarded a NCIDEA grant. As he pointed out, we're lucky to live in a state with such a cool grant program for startups. Anyone know of other states with similar programs? Refresh the Triangle meets on the fourth Thursday of each month. See you next time! PBS Teachers Unveils Their New Look!